AUCKLAND, New Zealand - Ramon Tribulietx insists his Auckland City FC team will be ready for whatever Hawke's Bay United throw at them after the Navy Blues wet weekend washout against Southern United last Sunday. Last week's showdown in Dunedin turned into a goalless damp squib as the rain bucketed down at the Caledonian Ground leaving the match abandoned just after the halftime break. Despite the long journey and setback, Auckland City FC remain in the leading pack but face a Hawke's Bay United side still finding its feet in the early weeks of the ISPS Handa Premiership. Brett Angell's side were beaten 5-0 in their season opener at Eastern Suburbs but turned in an eye-catching result when they fought back to earn a well-earned 2-2 draw with Canterbury United. Tribulietx expressed happiness with his squad's work in the build-up to Sunday and remains wary of a Hawke's Bay team that has traditionally given the Navy Blues a tough work-out. "Hawke's Bay are always tough in the way they set up. They set up deep and try to hit us on the counter attack. Teams that do that normally make your life very hard at Kiwitea Street and that could be the story on Sunday. "Hawke's Bay's first game against Eastern Suburbs showed that they perhaps weren't quite ready actively and physically and they looked underdone. I think we'll have to wait for a couple of games before we see the real Hawke's Bay United. "The reality is they have some very good players in their squad and last week they looked better against Canterbury United so for the way they play we've got our own ideas. But we need to be wary because sometimes teams come to us and change the way they play completely and it's a matter of readjusting in the game," he told www.aucklandcityfc.com. Injuries have also played a part in Tribulietx's thinking but the news is good for both Albert Riera and David Browne who rejoined training. Riera was sidelined by minor knee surgery but is back running while Browne is also making good progress following his horrorific head clash with Tasman United goalkeeper Corey Wilson. "Our only injuries are with Albert and David Browne but the good news is David trained yesterday on the bike which is great. "David still has a few headaches but he's back with the group. He's going to take a few more weeks to recover. He has fractures in his head that will take some time to heal but the good news is he's feeling better and back with the team. "Training has been very good this week and we've got players like Albert Riera looking very good and getting very close to rejoining full training with the team with the ball which is very good news. "We're in good shape. We had a training game on Wednesday to give minutes to some of the players who haven't featured as much and everyone is looking like they're sharpening up and in good spirits ahead of Sunday," Tribulietx said. Preparations for the Hawke's Bay United clash proceeded positively during the week with a friendly match against the Junior Navy Blues at the Croatian Cultural Centre in West Auckland that allowed the coach to run the rule over Camilo Speranza's proteges and give much needed game time to the wider squad. Tribulietx admitted the value of the exercise was fruitful with both objectives met and giving food for thought. "We always bring in one or two from Camilo's squad to complement our training sessions and at the same time we have a look and see how these players could fit into our set-up if there was an opportunity there to do so. The storied history of both the ISPS Handa Premiership and National Women’s League will be celebrated to mark the inaugural Heritage Week. "There's a few players in there who are interesting to us but with young players you have to be very patient and we keep quiet about how we go about this process. "These boys that are doing well need to keep doing what they are doing and reaching for a high level of consistency. "They need to understand that to make the leap to first team football they need to be patient and persevere and work hard. "The first team has a lot of quality players with excellent experience and the process to winning an opportunity with us is a long one and requires adaptation to a quicker, better, standard of football and that takes time. "We are talking about one or two of Camilo's group who could make that jump and when that opportunity arises we will look at it. "We look at their performances at training, the way they handle themselves and so they will earn that possibility like that. It's great to see we do have good quality coming through." The Junior Navy Blues National Youth League campaign continues on Saturday 3 November when they face Hawke's Bay United at the Croatian Cultural Centre at 12pm. 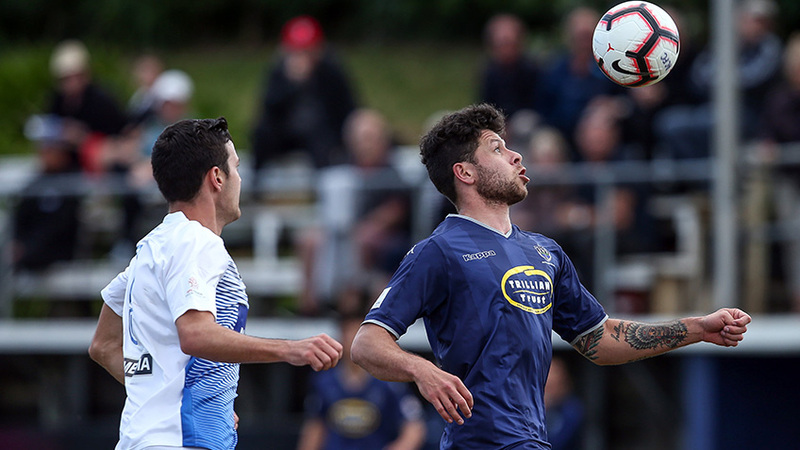 The Navy Blues' ISPS Handa Premiership showdown with Hawke's Bay United is on Sunday 4 November at 2pm NZST. Highlights of Sunday's game will be made available on Monday 5 November 2018 via ACFC TV and can be viewed at www.aucklandcityfc.com or via the club's official Twitter, Facebook and Instagram pages. This week's match is themed 'Heritage Week' by New Zealand Football and you can learn more here at this link. AC(squad chosen from): 1. Enaut ZUBIKARAI (GK), 2. Hayden McHENERY, 3. Takuya IWATA, 4. Mario BILEN, 5. Angel BERLANGA (c), 6. Brian KALTAK, 7. Cam HOWIESON, 9, Javier LOPEZ, 10. Micah LEA'ALAFA, 12. Dylan MANICKUM, 13. Alfie ROGERS, 14. Jordan VALE, 15. Dan MORGAN, 16. Yousif ALI, 17. Reid DRAKE, 18. Ruben PARKER (GK), 20. Te Atawhai HUDSON-WIHONGI, 21. Maro BONSU-MARO, 24. Cameron BROWN (GK). INJURED: David BROWNE (concussion), Albert RIERA (knee).